Students from the Children Development Centre (CDC) have an opportunity to continue their education at a Thai university, Rajamangala University of Technology, Tak. The university has decided to move forward with a scholarship program for students of the CDC. 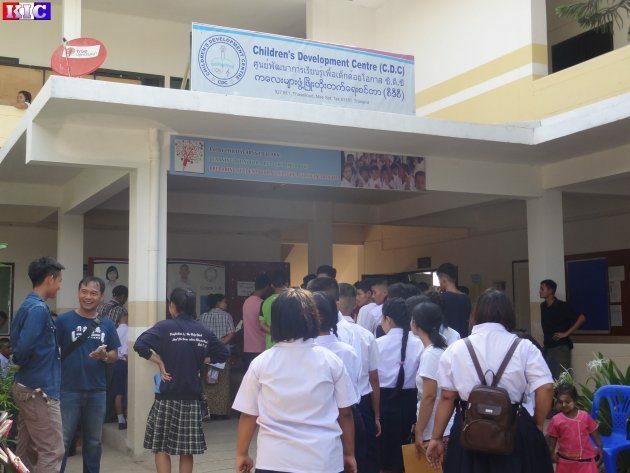 Qualified students from migrant schools in Tak province will have a chance to apply for a scholarship, according to Saw Myo Nyunt, the deputy headmaster of the CDC. Speaking to Karen News, Saw Myo Nyunt said. Saw Myo Nyunt explained that the applicants for the scholarship must have some form of legal documents, such as passports, a 10-year resident ID, or a pink work permit card. Students will be examined by a qualification committee composed of several border area educational organizations, and if they are selected, they can directly enter the university, he added. The Thai university will accept a maximum of 20 students to receive scholarships. Students who are interested in the scholarship program must have graduate certificates from grade 12 or above and can communicate fluently in either English or Thai. If granted a scholarship, students can study two-year programs such as, Welding Technician, Computer Technician, Electronic Technician or four-year programs such as Business and Liberal Arts, Engineering, Science and Fine Arts. A five-year Industrial Education (with teaching licenses) program is also available. Naw Paw Ray, chairperson of the Burmese Migrant Worker Education Committee said this is an exciting opportunity for migrant students. According to a statement from the scholarship program, the students will be offered expenses for university fees and housing. Students will have to cover the costs of food, school uniforms, transportation and healthcare. Rajamangala University of Technology, Tak (RMUTL, Tak) will start after August 15, students who are interested in the program will be selected by the qualification committee during July 2016.